Struggling to write this post today I realized I enjoy talking about the process of making quilts a lot more than the finished product. 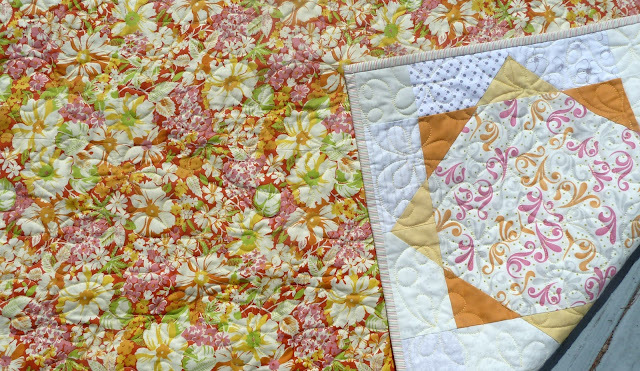 Don't get me wrong, I LOVE this quilt - there's just not much else to say at this point. Quick recap: I pieced the top and back of this one last summer. 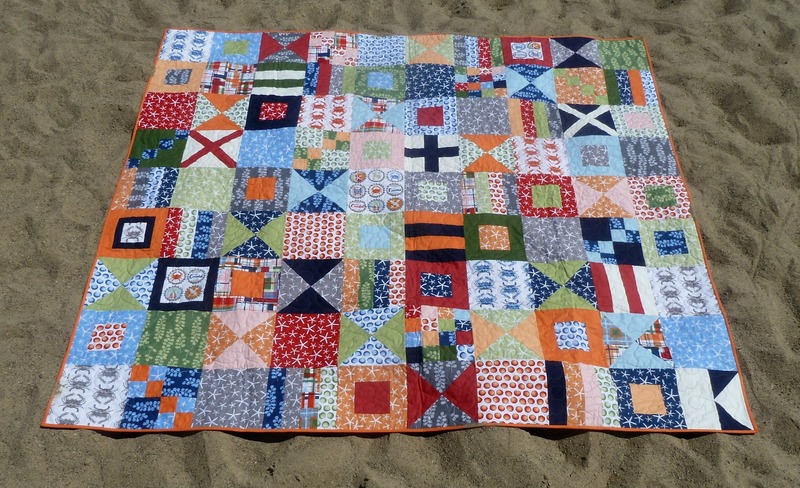 Since then it's been hibernating in the UFO pile waiting for summer to return to do duty as a beach blanket. 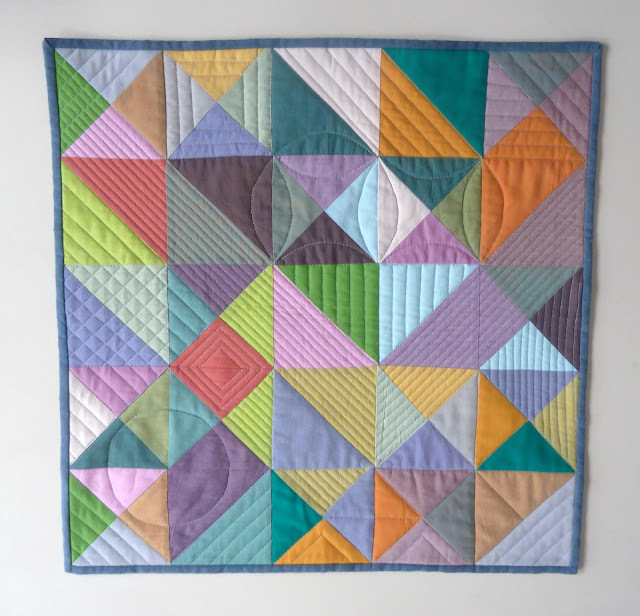 I finally rescued this to quilt at Laurena's before she closed. The Surf's Up panto is the perfect wave to meld everything together and the orange thread blends nicely on the front but gives lots of texture to the back. 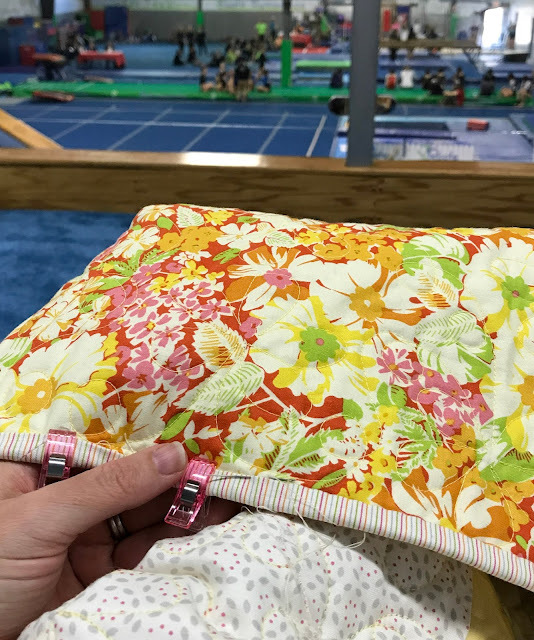 I don't tend to use a lot of orange but this Tangerine binding seemed perfect! 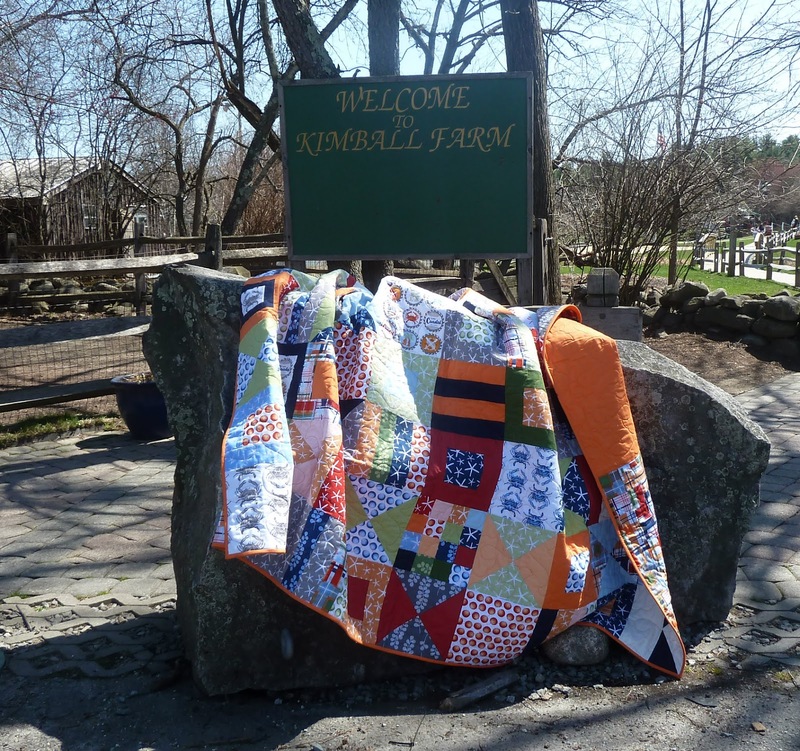 I wish it was really warm enough to head to the beach for a photoshoot but I took a practice run on the volleyball court at Kimball Farm. 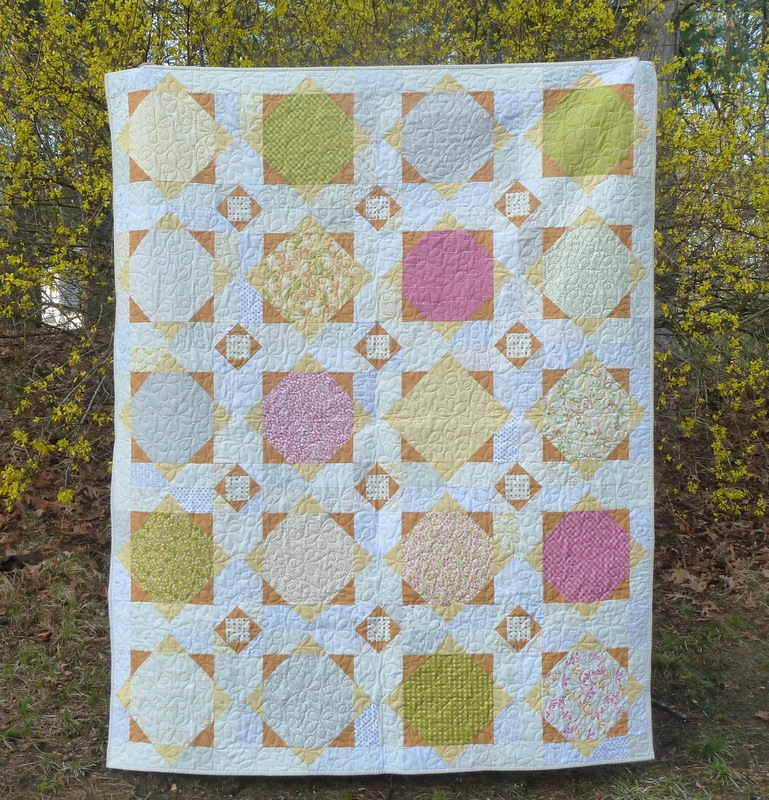 Dreaming of summer with this week's Finish it Up Friday by Crazy Mom Quilts. Finished quilt is 80" x 72"
Fabrics: Going Coastal by Emily Herrick. Michael Miller Cotton Couture: Love, Tangerine, Creamcicle. Free Spirit Designer Solids: True Red, Miracle, Burst, Sap, Leaf. Kona Cotton: Storm. Thread: Superior Threads King Tut in Orange Zest (1014). Quilting: Surf's Up pantograph by Dave Hudson. I knew I wanted to only use cotton lawn for my first quilt with this collection but I was also unsure how piecing would go with the lighter weight fabric so I opted for a pattern with simple pieces. A triangle quilt has been on my bucket list for a while so this seemed like the perfect opportunity. I cut all these triangles thinking this would be a perfect retreat project but never got to it. 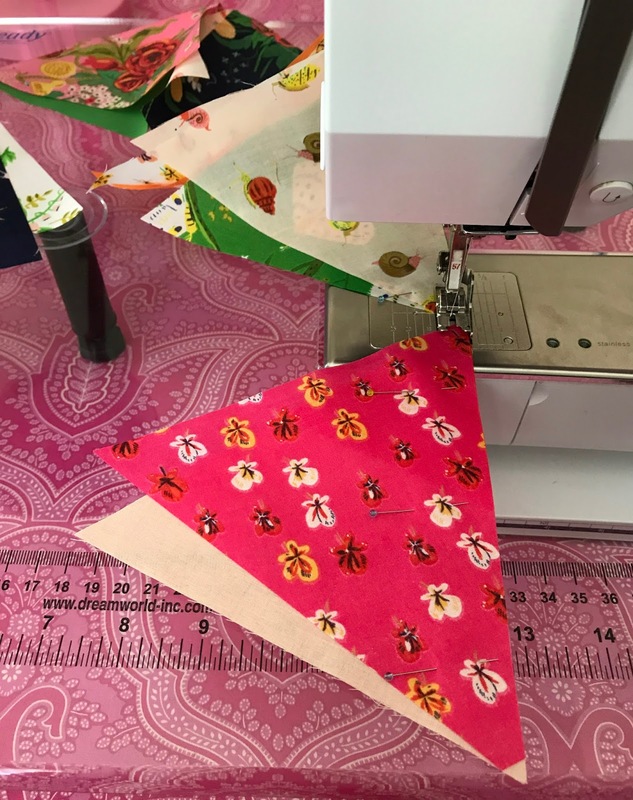 There are tons of great tutorials out there for making a triangle quilt but I found these tips from the Triangle Quilt Along at Sassy Quilter to be the best. I used the Triangle Squared ruler which solves the problem of offsetting your points. 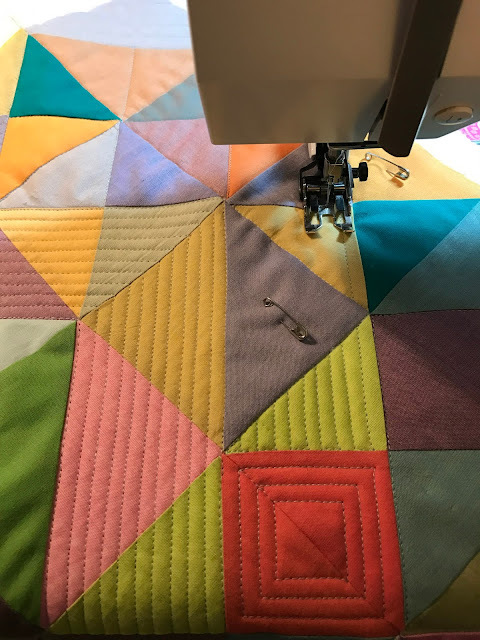 The cotton lawn isn't as sticky as quilting cotton so it was slow going pinning every seam when sewing but still good for chain piecing. Cotton + Steel put out some great tips for quilting with lawn. I didn't prewash as they suggest but I did switch to a 70/10 sharp needle and used 50 wt Aurifil for the piecing. I don't find Best Press to be as effective on the lawn. Next time I may try regular old spray starch. Our vacation week schedule is pretty packed but I've been sneaking in some after dinner sewing breaks and chipping away at this one. 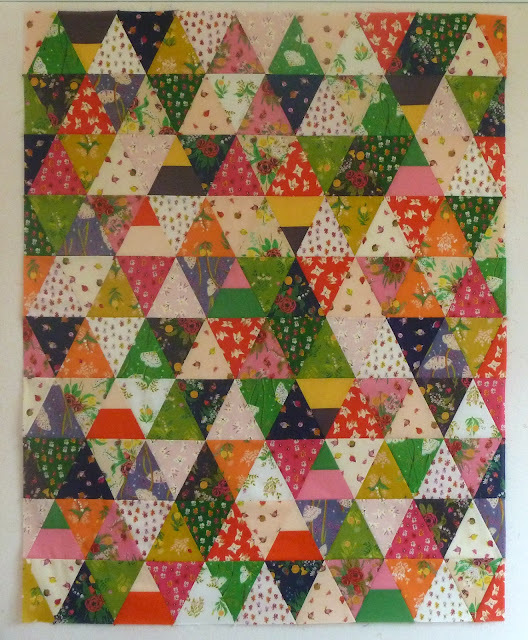 And those evenings add up... a finished flimsy:-) I'm feeling the loss of my LQS again, of course I don't have any batting on hand. I decided to go all out with Quilter's Dream Wool from Fat Quarter Shop (with a few treats thrown in for free shipping). Hopefully their quick delivery will get it here before I lose my momentum... Dreaming of snuggling up with this one should keep me going! How do you find time to quilt when life gets crazy? Spring is slowly starting to arrive to New England but this quilt makes its own sunshine. I started this one on retreat with the BostonMQG back in 2015. The pattern is Strawberry Fields from one of my all-time favorite books, Material Obsession by Sarah Fielke and Kathy Doughty. It's easy to construct the blocks but there were errors in the version of the book I have. Here is the errata with the correct cutting sizes. 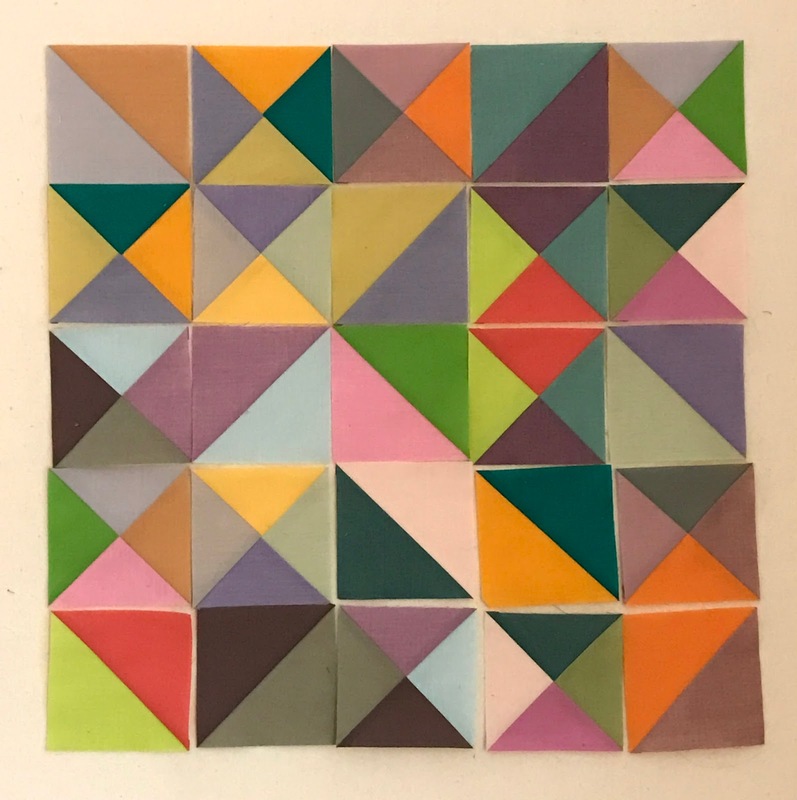 I'm so glad I made a test block before cutting all my pieces!!! This is an excellent pattern for layer cakes. 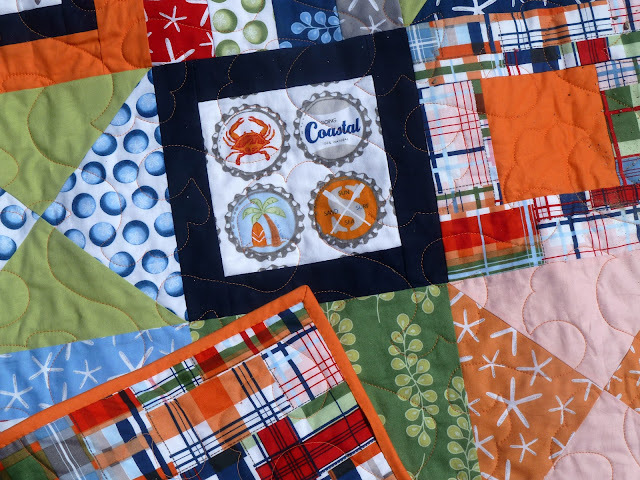 I love the way it showcases larger scale prints but also is a great way to use up scraps. 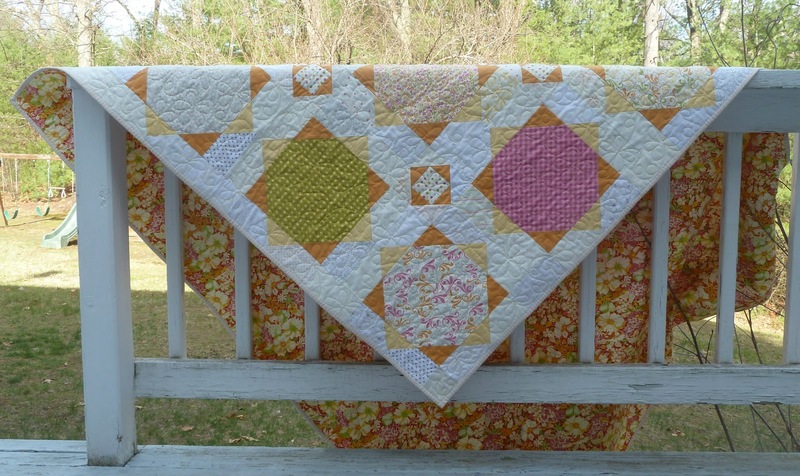 For this one I used a Sunkissed layer cake mixed with low volume scraps from my stash. Of course by the time I finished the top Sunkissed was long out of print but I scored this fabulous Anna Griffin print at Marden's. I love these two together!!! This had been languishing in the UFO pile but when I heard Laurena's was closing this was at the top of my list. I used Elizabeth Hartman's glue stick technique for pattern matching the back... look how perfect that seam is. 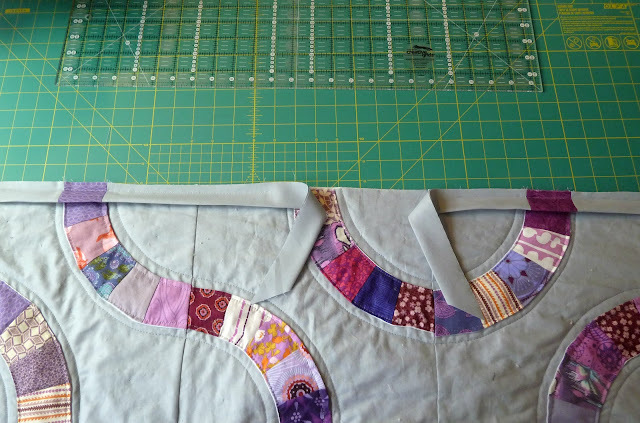 And of course I had to go with a striped binding to pull it all together. 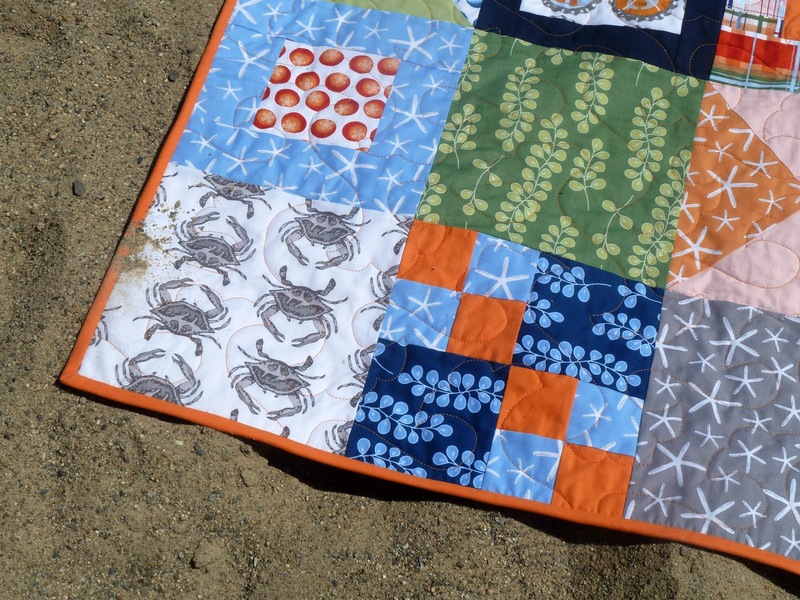 Soaking up some Sun with this week's Finish it Up Friday by Crazy Mom Quilts. Finished quilt is 60" x 74"
Pattern: Strawberry Fields from Material Obsession by Sarah Fielke. 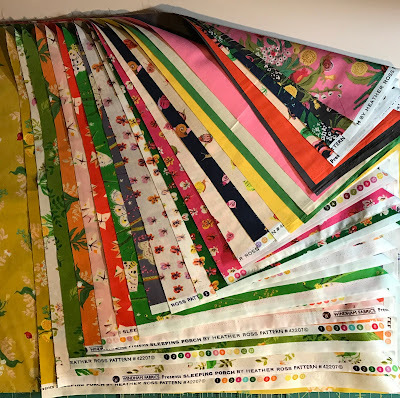 Fabrics: Sunkissed by Sweetwater for Moda. Assorted low volume prints from stash. Backing from the Carmen Collection by Anna Griffin. 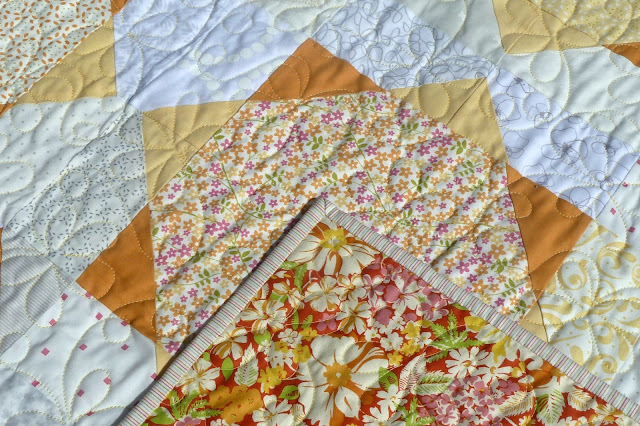 Quilting: Daisies Galore pantograph by Irene Steele. 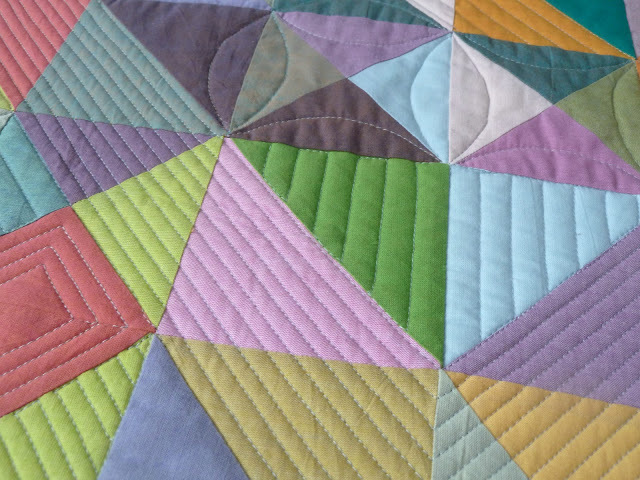 It's time once again for the BostonMQG's annual quilt show. 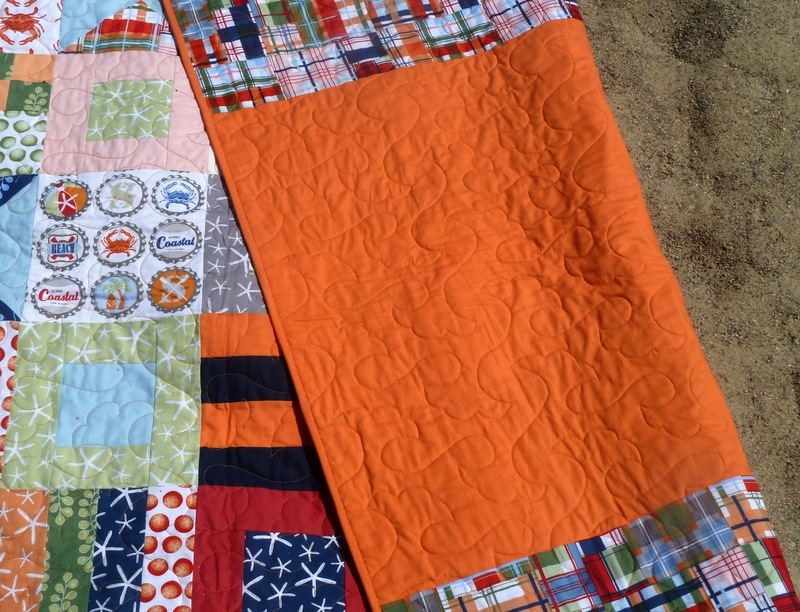 This year's mini quilt challenge is Improv. 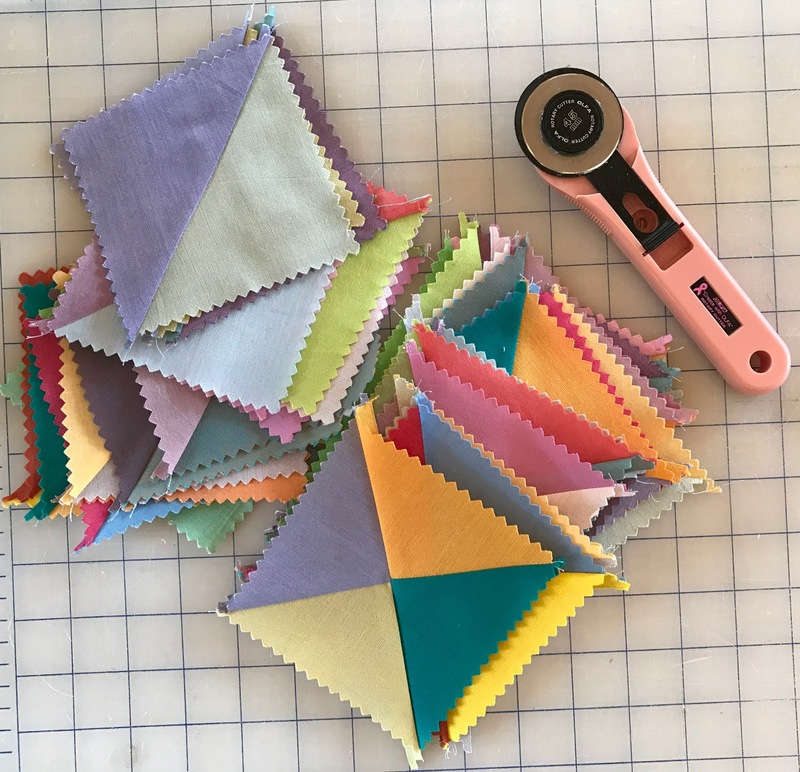 If you know me IRL you'll know I'm more of a "planned to the point of compulsion" kind of quilter so this truly is a challenge. While we were on retreat the amazingly generous Alexis gave me her Kaffe Fassett charm pack. 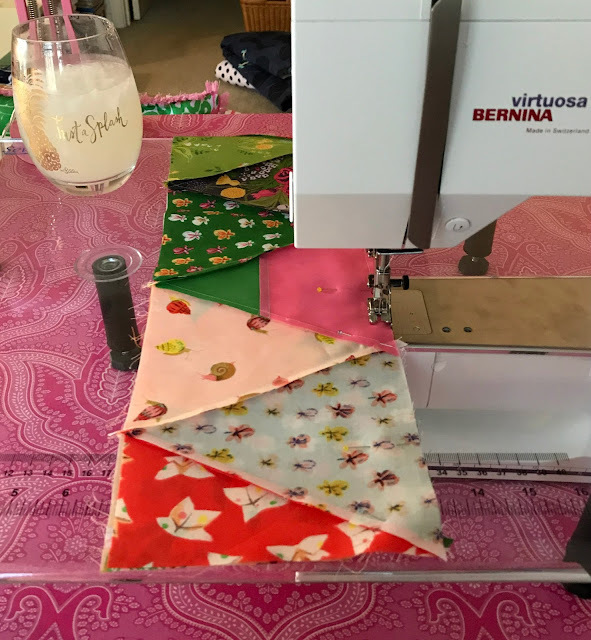 With no plan in mind I pulled a Denyse Schmidt and randomly pulled pairs to make HSTs and then some again to make QSTs. From there they went back in to the bag and I pulled them out and sewed them together into rows. No thinking about it or moving things around, just taking them as the were. 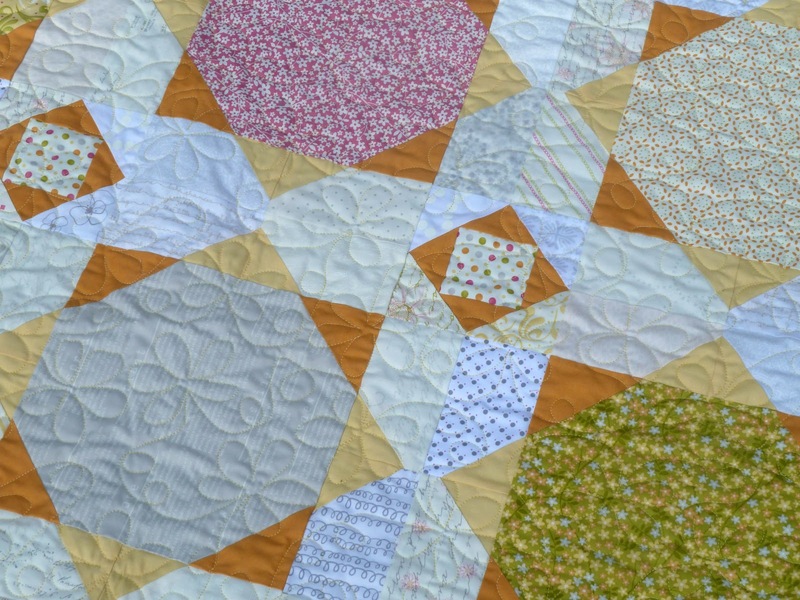 I tried to channel the same mindlessness for the quilting and just let the blocks lead me where they wanted to be quilted. I love all the texture!!! It was down to the wire but I managed to get the binding on and despite a freakish April 1st snow storm delivered to Fabric Place Basement. The show opens tomorrow and will be open weekends thru May 8th. If you're in the area you should definitely check it out! 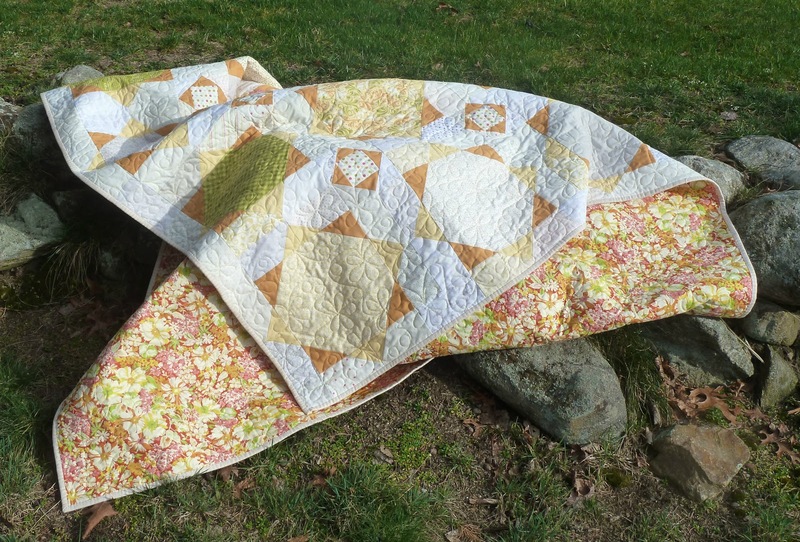 Winging it with this week's Finish it Up Friday by Crazy Mom Quilts. 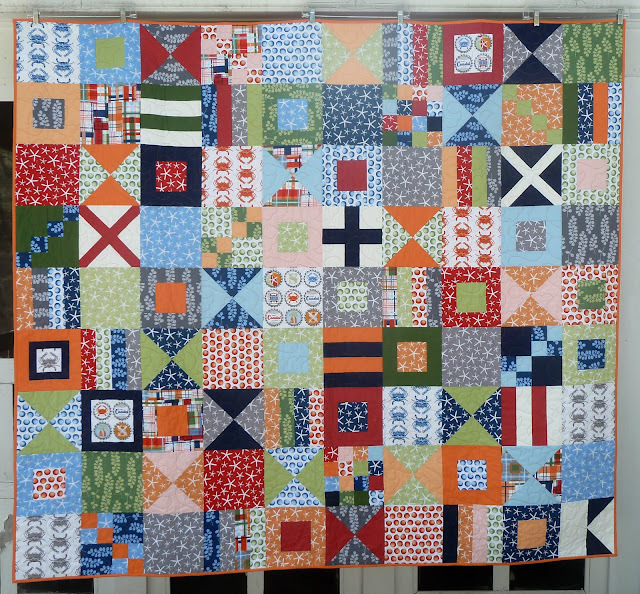 Finished quilt is 18" x 18"
Thread: 50 wt. Aurifil in Arctic Sky (2612).